In Spanish La Opulencia means "the opulent," and that's exactly the kind of smoke My Father Cigars was aiming for when it created My Father La Opulencia, which begins shipping to retailers this Friday. Introduced at the International Premium Cigar & Pipe Retailers trade show in July, La Opulencia was originally slated to ship earlier in the month, but Hurricane Irma offset the date. An old Cuban trademark, the Garcias resurrected the brand and have slotted it into the company's portfolio as an extension of the lauded My Father brand. The blend features a dark, Mexican wrapper that the Garcias classify as rosado oscuro, "different from anything else we have," in the My Father line, said José Ortega, vice president of sales for My Father. It sports two Nicaraguan binders, one Criollo and one Corojo, with various Cuban-seed fillers that were all grown on farms owned by the Garcia family, including the El Pedrero, Las Lometas and La Bonita plantations. 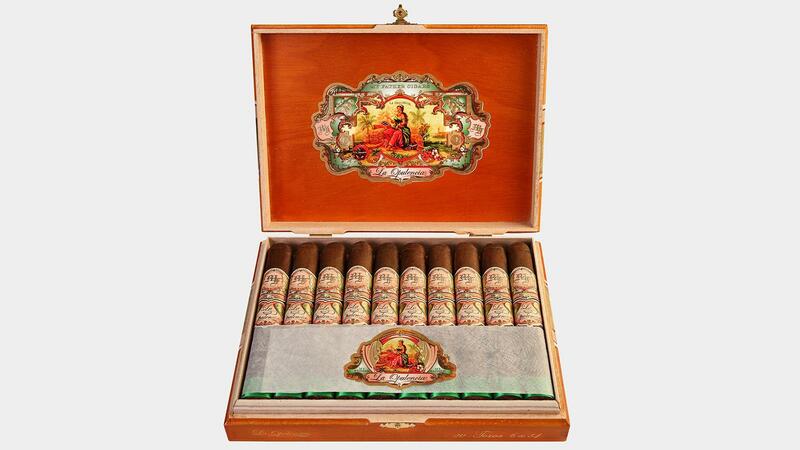 La Opulencia will be offered in six box-pressed sizes: Petite, measuring 4 1/2 inches by 48 ring gauge; Corona, 5 by 46; Robusto, 5 1/4 by 52; Toro, 6 by 54; Super Toro, 6 by 60; and Toro Gordo, 7 by 56. The cigars come in 20-count boxes and will retail from $7.10 to $12.54. Like all My Father cigars, La Opulencia was rolled in Nicaragua at the My Father Cigars S.A. factory, which is owned by the Garcia family. A version of this article first appeared in the September 19, 2017 issue of Cigar Insider.